The following pages have been reprinted from articles (which have recently appeared in various Journals), in answer to the many inquiries made in reference to the present position of John Worrell Keely, in his experimental researches, it having become widely known that he has not yet gained sufficient mastery of this force to construct a patentable engine, and that he has now turned his attention to Aerial Navigation in which one of the forces he has discovered can be used without an engine. Printed by Harvey & Co., 1 Goldsmith Street, Gough Square, Fleet Street, E.C. Through the blue fields of Natures wide domain." The whole in silent harmony revolve. What were his raptures then ! How pure ! how strong ! Their every latent glory to his view." BY S. ZOLVER PRESTON, P. 115. A quantity of matter representing a total mass of only one grain, and possessing the normal velocity of the ether particles (that of a wave of light), encloses a state of energy represented by upward of one thousand millions of foot tons. Or the mass of one single grain contains an energy not less than that possessed by a mass of 70,000 tons, moving at the speed of a cannon ball (1,200 feet per second); or, otherwise, a quantity of matter, representing a mass of one grain, endued with the velocity of the ether particles encloses an amount of energy which, if entirely utilized, would be competent to project a weight of 100 tons to a height of one mile and nine-tenths of a mile. Keely asserts that all corpuscules of matter may be subdivided by a certain order of vibration, thus showing up new elements, and having demonstrated what he asserts, by releasing the various orders of ether from the suspension in which it is always held in our atmosphere, he has answered the skeptical demand "Give us some bread." It has been said that as men penetrate deeper and deeper into a knowledge of the wonderful laws which govern the universe they may find that the mysterious forces which remain still undiscovered include not evolution only, but other methods grander still. Keely's discoveries promise to burst upon the world of science as the one mighty and complete revelation of the universe. There are more things in heaven and earth than are dreamt of in the materialistic science of our age, or in our philosophy, or even in our theology. "All we have cognizance of around us are results, the causes of which are supersensuous. Of the nature which we behold around us, the cause is supernatural." God never hurries. He chooses His own instruments and takes His own time to reveal Himself and His works to man. When Professor Hertz, of Carlsruhe, in experimenting upon the structure of ether, discovered that it was used in all electromagnetic engines, did it not occur to the minds of men that if ether has thus been unknowingly made the servant of man, in machinery not especially constructed for its use, John Worrell Keely may knowingly have imprisoned it, adapting his inventions to its special requirements? - Anglo-Austria. Keely demonstrates that all corpuscules of matter can be subdivided by certain orders of vibration, thus showing up new elements. Etheric philosophy has a scientific basis in fact; and, in the light of Keely's progressive researches, his views are no longer abnormal to the scientific mind which is broad enough to investigate them, as demonstrated by his experiments in sympathetic association. To discover an unknown power is one thing; to subjugate it is another. No one who has followed Keely in his "dead work" during the last ten years can doubt that he is dealing with the same force which, as Professor Hertz has disclosed to us, is already imprisoned without our knowledge in electromagnetic engines. This professor's researches into the structure of ether are rapidly leading him into the discoveries which constitute what is known as "Keely's secret," and which, when made known, will explain much that is now classed with the inexplicable. Mr. Edison will then better understand the force which he finds so mysteriously associated with electricity: for electricity is but one current of a triune stream, and the dominant current (which has never been controlled by man and never can be, any more than the lightning that flashes in the clouds) carries with it a sympathetically attendant force mysteriously associated, which gives that power of propulsion that induces disturbance of negative equilibrium. Chateaubriand rightly said:- "Man bears immensity within him;" and the teachings of etheric philosophy reveal how little of this immensity has as yet been made known to us! It leads us out of the labyrinths of other philosophical systems up to the simplicity of a single First Cause or Principle, and to the attainment of that unity which should be the object of all philosophical thought. Contains the order that its system rules." Had it not been for MacVicar's "A Sketch of a Philosophy," from which was compiled, in part, "Ether the True Protoplasm," Mr. Keely might never have discovered the nature of the force that he is now dealing with. To MacVicar, and to Mrs. F. J. Hughes, he is indebted for the suggestions which led him away from what is known as "The Keely Motor," to the line of experiment which has resulted in his present control of the force. Admitting the truth of Mr. Plum's remarks, but understanding fully the impossibility of carrying out his suggestions, until Mr. Keely himself knows more of the nature of the force that he has discovered, it is hoped that the following statements will give a clue to the mysteries which Mr. Keely is dealing with: at least to those in whom narrowness of mind has not caused stubbornness. We do not easily believe what is beyond that which we see: but the faith in Mr. Keely's discovery of an unknown force, which his demonstrations inspire, and which is gaining ground steadily, is not the belief which comes from "things hoped for." It is grounded "on the evidence of things seen" by competent and reliable witnesses. From the Philadelphia Inquirer of March, 30, 1890. SOME OBSERVATIONS ON THE INVENTION FROM A FOREIGN PUBLICATION. 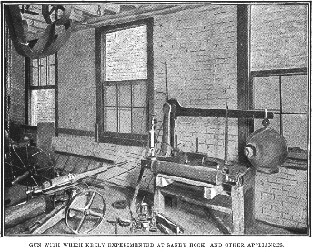 The following from a foreign publication about the Keely Motor will be of interest to all who have watched the progress of that enterprise. The correspondent writes:- "In the following brief article I purpose placing the latest aspect of Mr. Keely (perhaps the best abused man in America) and his investigations before the readers of Anglo-Austria. 909, Walnut-street, Philadelphia, October 4, 1889. "Dr. Leidy. Sir,- Referring to our conversation of a few days since, and the suggestion of another visit to the workshop of Mr. Keely, by Professor Barker, I would say that I have presented the matter to Mr. Keely and he acquiesces in what I stated to you. That is to say, if Dr. Barker desires to visit Mr. Keely's workshops again, and will make this known to him in writing or through yourself, for the purpose of further observation and of having confirmed or removed from his mind, as the case may be, the conclusions or impressions arrived at by him, and published in the columns of the Ledger, of this city, in 1878; and on condition that he will, if his further observations satisfy him that he did injustice to Mr. Keely, forthwith publish that fact through the same channel, the Ledger: (he being, of course, at full liberty to confirm by further publication his previous condemnation, if satisfied with the correctness of that conclusion) then Dr. Barker will be cordially received by Mr. Keely, and a series of experiments will be conducted for him at an early day, say, Saturday, 12 inst. And in the event of the engagement being made, I shall request the pleasure of your presence, and that of Dr. McCook. I leave the matter in your hands for such action as you in your wise discretion may think proper to take.- Very truly yours (signed), CHARLES B. COLLIER. Nothing could be fairer than Mr. Keely's proposal, and the result of Professor Barker's visit will be watched for with the keenest interest by all scientists on both sides of the Atlantic." Thus ended the remarks of Invention. "Professor Barker, after due consideration, concluded not to accept the invitation, and declined it on the 11th of October, suggesting Professor Goodspeed his associate in physics, as one who would probably be disposed to witness the series of experiments about to be given; showing the neutralizing or overcoming of gravity and the separation of metallic plates by vibration. After the date upon which these latter experiments were to have been made (and which I may mention, en passage, had been repeatedly made in the laboratory of Mr. Keely), this cablegram was sent from London to Philadelphia:- "Ask Dr. Leidy's permission to announce here his conviction that Keely has discovered a new force." "Having had the opportunity of seeing Mr. John Keely's experiments, it has appeared to me that he has command of some unknown force of most wonderful mechanical power." "Invention, in commenting upon the communication of October 19, says:- "We wish to make it quite clear that we do not identify ourselves with any of the opinions which are expressed in this communication. It is certainly desirable that the motor should be thoroughly tested, and particularly that all the secrecy, which has hitherto been practiced in connection with it, should be abandoned. There can be no reason why this invention, if invention it be, should not be published to the world as long as it is fully protected by patents. We agree, however, so far, that Professor Barker's report, if his visit be paid, will be of considerable interest." These remarks of our English contemporary are based upon quite wrong premises. The motor cannot be tested nor patented until it is completed. Mr. Keely's work is one of experimental research. His machine for the production of liberation of the power is in daily operation. He has made many failures in constructing his commercial engine, but each failure has brought him nearer to perfection. When he has succeeded in building an engine in which he can regulate the speed, control reversions and govern its operations as completely as the steam engine is now governed, then he will be ready to test its action publicly, take out patents for the same, and make known to the world the nature of his discovery. Up to the present time Mr. Keely's inventions have been principally devices, enabling him to experiment with the force which he has discovered and to obtain control over it. For years he was impeded by the frequency of the explosions which took place, breaking his ribs, paralyzing his left side for six weeks at one time, and frequently bursting iron tubes as if they were pipe stems. instance, some years ago he stopped his work on the graduating of his engine, to take his Liberator to pieces, in order to show its interior construction to Sir William Thomson and Lord Rayleigh;- these gentlemen, misled by Professor Barker's assertion, that Keely was deceiving his dupes with compressed air, refused to witness his experiments. There is no "secrecy to be abandoned," therefore. The question to be settled was not one of secrecy, but whether Mr. Keely should continue his experimental research, unimpeded by exhibitions, until he succeeded in perfecting a commercial engine; or whether he should first convince scientists that he is not the modern Cagliostro which he has been called, and that he is the discoverer of an unknown force. The ground taken by those who urged the latter course was that the interests of the Keely Motor Company would thus be better served; reasoning that, when scientists have been convinced that Mr. Keely's researches are in a field comparatively unknown to them; the cries of execration would be drowned in the applause which would resound throughout the world as the result of his stupendous labours became better known. For this end several scientists were invited to witness the present stage of experiment which Mr. Keely had reached, in his efforts to provide his provisional engine with a governor, and Dr. Leidy was one of the number who, after witnessing the experiments on May 28th, 1889, confessed himself convinced that Keely was dealing with some unknown force. When we call to mind Watt's persevering efforts during thirty years before he succeeded in his attempt to invent a governor for the steam engine we can afford to be more patient with Mr. Keely than we have been. Taking into consideration the marvellous advance which Mr. Keely has made in the past five years in perfecting his liberator, we should not be surprised to hear at any moment that he has also perfected his commercial engine (the so-called Keely Motor), thus overcoming his sole remaining obstacle to financial success. Those who talk of "testing" the motor, or of patenting it, in its present condition, are not aware of the stupendous exertions which have been made by Mr. Keely to bring the motor to its present stage of development; nor that although the motor now seems to be approaching perfection, the work of evolution will not be completed until it is in a patentable form. In 1759, James Watt made his first model of a steam carriage. In 1784 he took out a patent. In 1803 the first engine was built, but it was not until 1824 that the experiment of running a locomotive from Liverpool to Stockport was made. Until Keely's commercial engine is perfected and patented, now that scientists are beginning to support him as the discoverer of an unknown force, ridicule should give way to sympathy; for we know that nature never reveals one of her tyrant forces without at the same time showing how this force is to be transformed into the slave of man; and that complete success is only a question of time.- Anglo-Austria, March, 1890. Having become convinced that the important discoveries in science of John Ernst Worrell Keely should be disclosed to scientists without waiting longer for the successful application of this unknown force in mechanics I authorize you to make it known in your columns that the sum of five thousand dollars will be given to any university in New England that will send a physicist to witness Keely's experiments, who will bind himself not to give an opinion until the nature of Keely's discoveries has been made known to him, and he has seen the demonstrations which Keely is ready to make in proof of his claims as a discoverer, not as an inventor. Until Keely has mastered the principle both time and money are thrown away in attempts to construct a patentable commercial engine. A few months - or even weeks, possibly - devoted to experimental research, will do more toward this end than the building of dozens of engines to experiment upon. Professor Leidy, of the University of Pennsylvania, and James M. Wilcox, author of "Elemental Philosophy," are the trustees who are appointed to hold and to transfer the sum of five thousand dollars to the university that accepts the conditions; this sum to be applied to experimental researches in the field of molecular vibration. Very truly, H. OXNARD WARD. Communications on the subject of the above offer may be addressed to Joseph Leidy, LL.D., 1302, Filbert Street, Philadelphia, Pa.
DR. LEIDY SAYS A FORCE PREVIOUSLY UNKNOWN. THE RESEARCHES TO GO ON. "After having had the opportunity of witnessing a series of experiments made by Mr. John Keely, illustrative of a reputed new motor power, it has appeared to me that he has fairly demonstrated the discovery of a force previously unknown to science. I have no theory to account for the phenomena observed, but I believe Mr. Keely to be honest in his attempt to explain them. His demonstrations appear to indicate great mechanical power, which, when applied to appropriate machinery, must supersede all ordinary appliances." JOSEPH LEIDY. "After having witnessed on several occasions and under favorable circumstances, Mr. Keely's experiments in what he terms sympathetic vibration, I am satisfied that he has made new and important demonstrations in physical science. He has made manifest the existence of natural forces that cannot be explained by any known physical laws, and has shown that he possesses over them a very considerable control." JAMES M. WILCOX. Skeptical physicists should recall what Norman Lockyer writes of molecules in his "Chemistry of the Sun," viz., "That one feels as if dealing with something that is more like a mental than a physical attribute, a sort of expression of free will on the part of the molecules;" further more announcing in his Work, that "The law which connects radiation with absorption and at once enables us to read the riddle set by the sun and stars is simply the law of sympathetic vibration." Surely, it is better to be deceived than to throw stumbling blocks in such paths as Keely is exploring. J. W. Reynolds, M.A., writes:- "Those acquainted with scientific progress must be struck with the fact that of late the more brilliant achievements have been made in dealing with the unseen. The microscopist, the chemist, questioning the ultimate particles of matter, those who occupy themselves with the mysteries of molecular vibration, bear the victorious wreaths of successful discovery, and show that every atom teems with wonders no less incomprehensible than those of the vast and bright far-off suns." Keely had experimented for many years with the force that he discovered, more than twenty years ago, before he knew what he was experimenting upon. It was not until Macvicar's "A Sketch of a Philosophy" fell in his way, and "Harmonies of Tones and Colours - Developed by Evolution," written-by Mrs. F. J. Hughes, a niece of Darwin, that he turned his attention to the structure of ether and learned that "the same laws which develop harmonies develop the universe." At once the soul of each and God of all? A CORRESPONDENT ASKS THE INVENTOR SOME PERTINENT QUESTIONS. To the Editor of The Inquirer:- As the Keely motor has again come before the public through the columns of your enterprising paper, I would like to suggest a subject of inquiry in regard to it, which has always been avoided or evaded. Dr. Leidy is reported to hold the opinion that John W. Keely has discovered a new and wonderful force, and, without questioning the possibility of such a discovery, the most important question to be considered in regard to its use for motive power is the cost of its liberation or transmission. No matter what the nature of the force may be, its production must necessarily be accompanied by a corresponding expenditure of force in some form or other, otherwise the conclusion is inevitable that Mr. Keely is endowed with creative power commonly ascribed to Deity alone. If "vibratory sympathy" is a force to be liberated from a "sympathetic transmitter" by the "chord of the mass," then it is evident that unless the energy imparted by the "chord of the mass" is equal to that converted into "vibratory sympathy," the "sympathetic transmitter" must be called upon to transmit more than it receives. But the work of sounding a few chords is certainly not comparable to that of running the globe described at its high velocity for several weeks, and therefore the "chord of the mass" cannot be regarded as the source of the "vibratory sympathy" developed into rotary motion. How then is the "sympathetic transmitter" supplied with sympathy, and what does the supply cost in dollars and cents per horse power developed ? It is very true that steam and electricity were new forces once, and that their subjection to the service of man was not accomplished in a day, but it is equally true that steam, electricity, magnetism, heat, light, gravity, or any force known or unknown, must obey the law of conservation. In the economy of nature profit and loss must balance. The result accomplished cannot exceed the expense incurred. While civilization is advancing and wealth increasing, at an unprecedented rate, our coal fields at the foundation of it are all melting away, and the discovery of a new force is not so important as the discovery of new material to be consumed in the production of power. The vital question for Mr. Keely to settle is not whether distinguished scientists can explain the effects which he produces without going behind the scenes, but whether he can show that a foot pound of "vibratory sympathy" can be more easily developed from the resources of nature than a foot pound of good honest work. To the Editor of the Inquirer. SIR,- If you feel disposed to aid in correcting the erroneous views which prevail everywhere in reference to the nature of Mr. Keely's discovery of an unknown force (unknown even to himself until in 1885, he commenced to experiment on the structure of ether), will you kindly make a place in your paper for my answer to the questions of Wilfred Lewis, which appeared in this mornings Inquirer of the 8th of April? Those who have read Norman Lockyer's work on "The Chemistry of the Sun" will remember that he states therein that the law which connects radiation with absorption, and at once enables us to read the riddle set by the sun and stars, is simply the law of sympathetic vibration. To discover the workings of this law, and to apply it in mechanics was the aim and end of Keely's efforts for many years. From boyhood his experiments were all on this line of research, and up to the time he discovered that he had unknowingly imprisoned the ether his exhibitions were entirely confined to manifestations of mechanical power. Macvicar's work on the properties of ether first turned Mr. Keely's attention to the structure of ether, and Mrs. Hughes book on "Harmonies of Tones and Colours - Developed by Evolution" (not Mrs. Watts-Hughes, but a niece of Darwin, of Bedwyn Lodge, Sandown, Isle of Right) convinced him that the same laws which develop harmonies develop the universe. Since that time Keely's progress in his experimental researches has been something marvelously like inspired progress. His mistake has been in attempting to run machinery before he had given sufficient research to the nature of the laws which control the operation of the force that he discovered more than twenty years ago. Is it necessary for the brain to receive the amount of energy which is expended by the physical, as indicated by Mr. Harvey Spencer Lewis in his illustration of mechanical forces? The energy of a thought, which it has been supposed quite impossible to measure, in grains even, produces millions of times more power on the physical than the focalization of that thought. This is the difference between the sympathetical and the mechanical. The force of thought cannot be multiplied by mechanical means, making it give pound for pound. If it could be done it would annihilate both the mental and physical. as Mr. Keely has done, accomplishing in his sixty-three years of life what, if he had lived a thousand years, he never could have done without the superhuman influence which men call "inspiration." In his experiments he is dealing entirely with mental and polar flows; he does not create, but he has made it the study of his life to comprehend the great laws of nature which govern creation instead of sneering at unknown laws. Mr. Harvey Spencer Lewis writes as ignorantly of the "sympathetic transmitter" as a child might write of "The Birth Of A World" (the title of one of Mr. Keely's papers), when he argues that it must transmit more than it receives. The sympathetic negative transmitter is an instrument for associating by a certain order of vibration a sympathetic link with the polar magnetic and electric streams (and with all the sympathetic flows associated with gravity) for operating sympathetic machinery. It may be compared to a kite, and the polar terrestrial flow to the boy who holds the string that flies the kite - while the sympathetic link, that is established between the boy and the kite, represents the chord that controls its action. Evidently Mr. Harvey Spencer Lewis has no idea of sympathetic forces; not even the faintest idea. Therefore, he should not attempt to write upon a subject concerning which the world is as yet profoundly ignorant. Mr. Keely has never pretended that the "mass chord" is "the source" of vibratory sympathy; but he teaches that the force which controls any one chord of mass, either physical or mechanical, must be represented by the concordant of that mass, in the focalization of their neutral centres, in order to produce any action or effect on that particular mass; no two aggregations, as to the number of molecules in each, being alike in nature. Mr. Harvey Spencer Lewis asks what the supply of sympathy costs in dollars and cents. As I am interested purely from the scientific side of Keely's discoveries, it satisfies me to know that he will give to the world what Drummond declares to be "the one hope for science," viz., "more science," but I will answer to the best of my ability Mr. Harvey Spencer Lewis question, "What does the supply cost in dollars and cents per horsepower developed?" It costs nothing more, after the machinery is made, than the vibratory concordant impulse which associates it with the polar stream. The twanging of a taut string, the agitation of a tuning fork, as associated with the resonating condition of the sympathetic transmitter, is all that is necessary to induce the connective link, and to produce this "costless motive power." As long as the transmitter is in sympathy with the sympathetic current of the triune polar stream, the action of the sympathetic instrument or engine continues. Again, mechanical conservation of energy is one thing; sympathetic conservation is another, and we cannot expect Keely will reveal what he has discovered concerning the forces that he is dealing with until he has himself acquired that full knowledge of their action which will protect the rights of those who are interested in the "dollars and cents" part of "the enterprise." Some writer has said that if extreme vicissitudes of belief on the part of men of science are evidences of uncertainty, it may be affirmed that of all kinds of knowledge none is more uncertain than science; but slow as mankind is in the progress of discoveries bearing upon unknown laws of nature, men of science are still slower in recognizing truths after they have been discovered and demonstrated. Two centuries elapsed between the discoveries of Pythagoras and their revival by Copernicus. Tycho Brahe opposed the Pythagorean system until his death; Galileo, adopting it and demonstrating it in all its purity, suffered for his support of it at the hands of bigots. And so history now repeats itself. Were it possible to convince scientists en masse of the grandeur of Keely's work, they would protect him from the interruptions and law suits which have so retarded his progress that now it looks very much as though he would never be permitted to complete his system. The world is full of inventors, but there is but one man able to unfold, to this age and generation, the wonderful mysteries attendant upon vibratory physics, while there are thousands who, when a mastery of the principle has been gained, can invent machinery to apply it to commercial uses. MacVicar asks, "Who that goes so far as to make a question of all, or almost all, the data of common sense can legitimately refrain from making it a question whether the laws of phenomena which men of science discover may not be laws of thinking, merely improved upon nature as her laws? Nay, who can refrain from admitting with Kant that they can be nothing more?" the human mind, such is the energy of that immortal and godlike principle which lives within us, that we are baffled without being discouraged, our very defeats quickening our resources, and we may hope that our descendants, benefiting by our failure, will profit by our example, and that for them is reserved that last and decisive stage of the great conflict between man and nature, in which, advancing from success to success, fresh trophies will be constantly won; every struggle issuing in a conquest, and every battle ending in a victory." From the Evening Telegraph, Philadelphia, April 13th, 1890. Professor Leidy's Adherence to the New Force. Dear Professor Dewar.- As I have already informed you, I carried out your wishes in reference to Professor Rowland, of the John Hopkins University, as far as extending to him an invitation to witness some of Mr. Keely's experiments in sympathetic vibration was concerned. Professor Rowland was not able to witness any demonstrations whatever, on account of an accident which happened to the disintegrator; and he could not fail to have formed an unfavorable opinion of Mr. Keely from all that transpired on that occasion. I next reviewed the invitation to Professor Barker, which had already been extended to him by Professor Leidy, both these gentlemen being Professors in the Pennsylvania University. Professor Barker was not able to be present. The series of experiments which have been given for scientists, mechanical engineers, and others, since my return, closed on the 12th. The steady progress, from week to week, since the accident to the disintegrator was repaired, has given beautiful evidence of the wisdom of the plan adopted by Mr. Keely in the winter of 88-89, which led him to turn his attention to a class of experiments of quite a different nature from those which up to that time had been made for commercial ends; experiments which have not failed to convince all who attended the entire series that Mr. Keely is dealing with an unknown force, the laws governing which he is still in partial ignorance concerning. He admits now that he cannot construct a patentable engine to use this force until he has mastered the principle, and a fund, with the approval of scientists, has been appropriated for his use to this end; upon the condition that he will waste no more time upon what is known as the Keely Motor Engine until he has demonstrated his ability to control reversions and in all points to govern the revolutions. stock, and in this way to furnish Mr. Keely to the end with the funds that he needed. But the exhibition of this engine was premature and did not succeed. There will be no further need of such exhibitions in future, for it is, as it always has been, in the interest of the stockholders that the stock should not rise until the engine is completed; when the stock will rise to remain raised. From this time the interests of the stockholders will not be sacrificed, as in the past, to the interest of stockjobbers. The experiments given on Saturday last surpassed preceding ones in the purity of the demonstrations, the instruments being in a better condition. In demonstrating what secures to be the overcoming of gravity, (or Aerial Navigation, Mr. Keely used a model of an air-ship weighing about eight pounds, which, when the differentiated wire of silver and platina was attached to it, communicating with the sympathetic transmitter, rose, descended, or remained stationary midway, the motion as gentle as that of thistledown floating in the air. (See frontispiece). The experiment illustrating "chord of mass" sympathy was repeated, using a glass chamber, 40 inches in height, filled with water, standing on a slab of glass. Three metal spheres, weighing about six ounces each, rested on the glass floor of the chamber. The chord of mass of these spheres was B flat first octave; E flat second octave, and B flat, third octave. 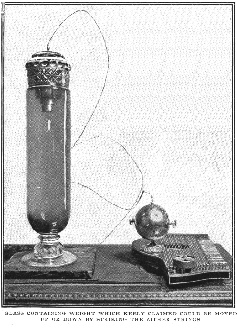 Upon sounding the note B flat on the sympathetic transmitter, the sphere with that chord of mass rose slowly to the top of the chamber, the positive end of the wire having been attached, which connected the covered jar with the transmitter. The same results followed the sound of the note in sympathy with the chord of mass of the other spheres, all of which descended as gently as they rose, upon changing the positive to the negative. J. M. Wilcox, Ph.D., who was present, remarked "This experiment proves the truth of a fundamental law in scholastic philosophy, viz., that when one body attracts or seeks another body, it is not that the effect is the sum of effects produced by parts of one body upon parts of another, one aggregate of effects, but the result of the operation of one whole upon another whole." The experiments on the 12th closed with the disintegration of water, twelve drops of which we saw dropped, drop by drop, into the small sphere attached to the disintegrator, after exhausting the air by suction. A pressure of over 20,000 pounds to the square inch was shown to the satisfaction of all present, and when Mr. Wilcox accepted Mr. Keely's invitation to take a seat on the arm of the lever, adding his 200 pounds to the weight, applause broke forth. Mr. Keely showed control of the ether (interatomic subdivision) by graduating the escape of the residue, as he allowed it to discharge itself with a noise like the rushing of steam to an expulsion as gentle as the breathings of an infant. The three subdivisions acted simultaneously, showing instantaneous association and disassociation. The sympathetic globe was operated upon, 120 revolutions a second, ceasing the instant that the wire was detached. nor have I been able to get the opinion of any physicist in whom I felt any confidence; but Mr. Keely is satisfied to have the support of such men as J. M. Wilcox, Ph. D., and Professor Leidy; LL.D. Dr. Leidy was awarded the Lyell Medal in 1884, when in London, and the Cuvier Prize in 1888, from the Academy of Sciences in France. He is known in America not only as possessing the broadest of minds and the gentlest of natures, but as holding in his heart that love for, and reverence of, truth and justice which alone can confer the power of forming a correct and a just judgment. I would like to have you make known in England that Mr. Keely is indebted to Macvicar's "A Sketch of a Philosophy" for turning his attention in 1884, to researches on the structure of ether, and to Mrs. F. J. Hughes, a niece of Darwin (not Mrs. Watts-Hughes), for the suggestions in her work on "Harmonies of Tones and Colours - Developed by Evolution", which led him into the line of experiment that now enables him to show on a disc the various colours of sound (each note having its colour), and to demonstrate in various ways Mrs. Hughes own words "that the same laws which develop harmonies develop the universe." AN OFFER OF FINANCIAL AID TO THE INVENTOR FOR EXPERIMENTAL PURPOSES ONLY. There has been placed in the hands of Professor Leidy a fund for the use of Inventor John W. Keely for the construction of a patentable engine. The stipulation attached is that no use shall be made of the financial assistance for speculative purposes. In his letter, H. O. Ward, who gives the money says: This provision, which is made in the interests of the Keely Motor Company, as well as for science, will end with the first attempt to speculate on the stock by exhibitions given of the operations of unpatentable engines. Professor Leidy holds the fund at his disposition, and will pay all bills for instruments constructed for researching purposes. mastery of the principle as to make the construction of a patentable engine possible." "In consideration of this agreement, I hereby pledge myself to furnish Mr. Keely with the funds which he needs to pursue his researches up to the time of the building of the engine for the Keely Motor Company, when that company must resume its responsibilities, or make such terms as shall be satisfactory to Mr. Keely and to me." I, etc., etc., give and bequeath to John W. Keely an annuity of two thousand five hundred dollars, payable in advance, in monthly installments, as long as he needs the money to continue his researches, and up to the time that he gains sufficient control of the unknown force that he has discovered to enable him to construct a patentable engine, machine, or instrument for the Keely Motor Company; the stockholders of which have had their interests sacrificed hitherto, in my opinion, by the action of its managers in requiring the building and operating of unpatentable engines, to exhibit the same for speculative purposes, in part, and to raise money for the support of the enterprise. Furthermore, I direct, in addition to this bequest, that all bills for instruments made for Mr. Keely's experimental researches shall be paid by my executors as long as he receives no pecuniary assistance from the Keely Motor Company, provided said bills are approved by Professor Leidy, LL.D., or James M. Wilcox, Ph. D.
A GREAT MYSTERY WHICH EVEN EDISON HAS BEEN UNABLE TO SOLVE. is expending energy until it foots up an almost inconceivable total of actual power. Not alone that, but the magnet of one pound lifting power today may and will be stronger tomorrow. Where does all this really tremendous amount of energy come from? By what inscrutable process does the mere magnetization of a bar of steel make of it a machine for the transformation of energy? Not a reactory or storage device, which, like a steel spring, honestly gives back approximately all it has received, but a perpetual transforming or converting machine. There is a hidden process going on of some kind; energy is going into the magnet all the time it is doing work - energy in some form. Where does it come from - gravity? atmosphere? solar rays? earth currents? Who can say? It is a great problem, worthy of a lifetime of indefatigable research. PROF. DOLBEAR TAKES ISSUE WITH THE "REVIEW" WRITER. To the Editor of Electrical Review. SIR,- In your issue dated November 16th you reproduce a portion of an article published over a year ago, and which you say has attracted great interest and has been frequently published by others. The subject is: "The Microbe of the Magnet." I remember seeing the original article, and imagined that it had been written by some one who either wanted to puzzle some of the uninitiated or who was in a state of unstable equilibrium himself on the mechanical question involved. As it is stated that there is really a question of expenditure of energy in the case of an armature being held up by a magnet, I have thought it might be well to point out the error to the writer and others who have thought the statements of the article to be true. "It will hold that pound for an eternity, and every second of that time without end the magnet is expending energy, until it foots up an almost inconceivable total of actual power." The words I have italicized contain the untrue statement. the distance the weight is raised, is zero - no work is done and no energy is therefore expended. Now, in the case under consideration, the armature does not move - consequently h=0 - no work is done, and consequently no energy is expended. 0 be accounted for than that the molecules of the magnet itself should cohere together. Further on the inquiry is made: "By what inscrutable process does the mere magnetization of a bar of steel make of it a machine for the transformation of energy?" Why, if no energy is being transformed, it is not the machine it is supposed to be, and no inquiry needs to be made as to where it gets that which it does not get, nor how it can do that which it does not do. In Electrical Review of May 10th. SIR,- In a number of the Electrical Review a writer, under this heading, asks where the energy comes from which feeds the magnet; whether "from gravity, from the atmosphere, from solar rays, or from earth currents? Who can say? It is a great problem, worthy of a lifetime of indefatigable research." Professor Dolbear, in a later number, answers these questions as only one of the "uninitiated" would answer; yet, nothing is more simple than the truth, as to the source of energy in the magnet to those who are conversant with Mr. Keely's theories and have witnessed his demonstrations. It comes from the polar stream; and, though the introductory impulse is so slight that it cannot be weighed any more than can the flow of the mind, yet, if kept up for years, it could not be computed by billions of tons in its effect. The magnet that lifts pounds today, if the load of the armature is gradually increased day by day, will lift double the amount in time. Whence comes this energy? Keely teaches that it comes from sympathetic association with one of the triune currents of the polar stream, and that its energy will increase as long as sympathetic flows last, which is through eternity. The physicist tells you that "you cannot make something out of nothing;" that "in the economy of nature profit and loss must balance;" that "no matter what the nature of the force may be, its production must necessarily be accompanied by a corresponding expenditure of force in some form or other," etc., etc. But, in the prodigality of nature, this energy flows, without measure and without price, from the great storehouse of the Infinite, from the sympathetic portion of the etheric field, where all visible aggregations of matter emanate, and on the same order that molecular masses of all living organisms are vitalized by the sympathetic flow from the brain. In opposition to Dolbear, Keely would contend that a force or flow of sympathy, exerted to carry a load indefinitely, whether the load it carries is in motion, or entirely quiescent, is the same substantially in the one as in the other. The mere fact of the magnet carrying its load proves conclusively the constant flow or positive action of a sympathetic force, the velocity exceeding millions of vibrations per second. a weight on a hook, which would make the polar magnetic flow and the suspension of the weight on the hook about one and the same thing, as regards the principle that holds them together, as if a dead body, after decapitation were held to its head by a hook and that, under such condition, the sympathetic flow which exists during life, between the head and the body, continued to pass from the brain through the hook to the body, controlling its movements as in life. This is not sound philosophy. Philosophic knowledge, in the widest acceptation of the term, is the knowledge of effects as dependent on their causes. It has been defined as the science of first principles, the science of causes. Wilcox defines science as a series of systemized reasonings deduced from facts or from other reasonings through premises furnished by evidence or authority; and going back to self-evident metaphysical truths as fundamental knowledge. But what knowledge have we? We know very little, it anything, of first causes; therefore, we have no sure basis for knowledge; and, consequently, very little true philosophy; very little true science. If, as Buckle asserts, the laws of nature have their sole seat, origin, and foundation in the human mind, then the highest of our so-called science has never had a sure foundation on which to build the edifice of pure philosophy. Our most learned men know not what magnetism is, nor electricity, nor gravity, nor cohesion, nor force. Keely, the discoverer of etheric force, and of the means of overcoming gravity, is the first man whose discovery is connected with the laws of mental science. He tells us that gravity is a certain form of etheric vibration; that electricity is a certain form of atomic vibration; that cohesive force is, like gravity, an ever existing force of sympathetic negative attractions holding together all molecular masses, and that were the vibrating velocity of this force to cease for one moment, all aggregations of matter that exist in nature would fall apart and pass back into the ether. If Professor Dolbear's reasoning were carried out, down to molecules, we might expect to find them held together, in their different forms of invisible matter, by hooks, instead of by sympathetic association or links of sympathy. Such seems to be the philosophic range in his answer to the reasoning of the one who wrote the article on the source of the energy in the magnet. that he has struck the chord of the mass, just as Keely does with his weights in his jars of water. He then notes in his book that the second stanza in the "Boulanger's March" is the chord of the mass of the French ironclad La Terrible. These books will have to be carefully indexed, and when any foreign power comes to shell New York, as soon as the name of the ironclad is signaled from Sandy Hook a monograph will be loaded with the right chord and sent in a submarine boat to the enemy's side. The ironclad will then rise out of the water just as Keely's weights do, and it can be kept up high enough to allow Mr. Keely to play the chord that will turn it upside down and drop its contents into the bay. It has been said that "sneers and ridicule are the weapons of small souls and silly minds, but "to the mind of an engineer," Mr. Keely's discoveries must seem as unpractical in naval warfare, or in any branch of mechanics, as it has been, over and over again, represented to be. Still the time has passed by for sneers, now that the man with the most truly scientific mind in America has announced his belief in the discovery of an unknown force. "Keely's methods, and his failures, have combined to engender distrust and even arouse ridicule, but in the light of last Saturday's display before Professor Leidy and others it will not do to deny that Keely has discovered that which no other man has discovered." The time seems to be ripe for instructing engineers who fancy that experiments made in researching the laws of nature, which govern this unknown force, are methods which are to be used in its application to mechanics. Let Mr. Keely's method of controlling his air-ship in aerial voyages serve as a practical suggestion to those who can have no comprehension of the principle which he has, for this end, seemingly mastered. The instrument within the aerial ship which controls its ascent and descent consists of a row of bars like the keys of a piano, representing the enharmonic (or celestial) and the diatonic (or terrestrial) conditions. These bars range from 0 to l00. At 50, Mr. Keely thinks the progress of the vessel will be 500 miles an hour. At l00, gravity resumes its control. If pushed to that speed the ship would descend like a fireball to the earth. There is no known force so safe to use as the force which propels and controls the air-ship, for when the celestial and terrestrial conditions are once set up, they remain for ever; perpetual molecular action is the result. In event of meeting a cyclone, the one whose office it is to guide the course of the vessel can cause it to ascend above the cyclone by simply dampening a certain number of these vibratory bars. concordant with the celestial and terrestrial streams, the control of it in all particulars is as easy and as simple as the control of the metal spheres, and of the metal experimenting model, which Dr. Leidy and others testify as to having witnessed on various occasions. In ascending the positive force is used (the celestial), and in descending the negative or terrestrial. Passing through a cyclone the air-ship would not be affected by it. Mr. Keely thinks that the breaking up of cyclones will open a field for future research; for, if a way is discovered for obtaining the chord of mass of the cyclone, one has only to differentiate the chord of its thirds to destroy it. No anxiety need be felt by engineers as to the possibility of striking the "chord of mass of the City Hall or the Pulitzer building," as suggested by Mr. Foster. To disintegrate certain conditions are necessary which could not be maintained in the demolishing of such structures. One would think with the facts set before Mr. Foster it might have occurred to him that bombshells dropped from an air vessel in naval warfare would be a better way of utilizing Keely's discoveries than to use silk thread and mouth-organs in the manner that he proposes in his letter. On Sunday last I had a long and most interesting interview with Dr. Leidy, in which he went over all the details of his connection with Mr. Keely. I found fresh reason to admire his transparent integrity, and sincerity, and the perfect openness of his mind to fresh truth and scientific conviction. Nothing can be so beautiful as this in a man of his age and eminence, etc., etc., etc. It has drawn my sympathy strongly towards you, to find that you have appreciated and valued this great man at his true worth, etc., etc., etc., etc. N.B.- Lippincott's Magazine for July will contain Keely's Contribution to Science, disclosing some of his discoveries. "I think that now at last Keely's labors are about to be honorably recognized in the world of science. May he live to rejoice in his triumphs." "If Mr. Keely succeeds in making his discovery practically useful, as it is said that he is demonstrating to scientists his ability to do - if this information be true, it is strange to contrast the past history of science with the present. Fancy the discoverer of electricity having succeeded in inventing the modern Dynamo machine! "Such a fact would mean the concentration of hundreds of years of scientific discovery and invention into the single life of one man. Such a result would be simply marvelous."